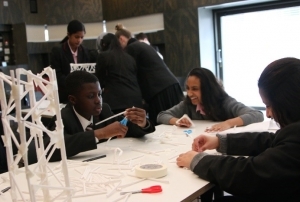 Education and Employers, under the Career Footsteps Campaign, worked with the Learning Department at the National Theatre to support their STEM: Creative Choices event on the 26 March. 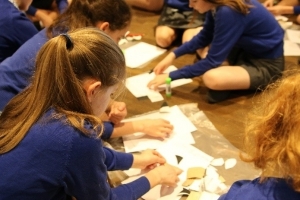 The event was aimed at year 7 and 8 students to showcase how STEM subjects can be applied in the performing arts. This exciting day involved an array of technicians from sound, lighting, costume and set design. The day was attend by 160 students from eight different schools, and began with students meeting on the set of the upcoming production The Great Wave. They were treated to a live demonstration of set in action during one of the plays climatic scenes. This then led on to a Q&A session with the technician responsible for the design and operation of the set. 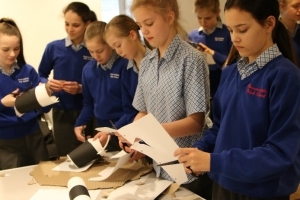 Students were then split into groups and went on to two different workshops, as well as a backstage tour. One of the workshops involved looking at costume design. Students got to look at sketches of characters from a previous production at the theatre called Wonder.Land. They were then tasked with creating their own costumes for characters from the play! Another of the session looked at the triangulation of truss, which are commonly used in the production of sets and on-stage performances. Students were split into small working groups where they were given a brief based on a scene from a play. Based on the requirements of the scene they then had to construct a truss that would meet the needs of that play. 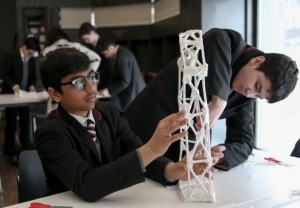 “Many people believe that careers in the Theatre have come from studying drama or English literature but actually behind the scenes there are a vast array of jobs that use the STEM subjects everyday. 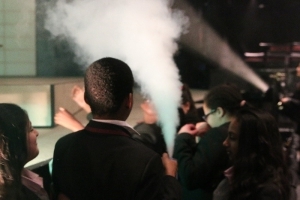 Students were treated to workshops on both lighting and sound. Returning to the set of the great Wave, they had the chance to light the set and learn from the technicians how they develop lighting for the production. 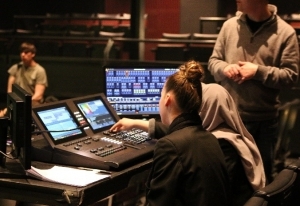 Alongside this another workshop allowed students to put together both the lighting and sounds for another play, which were then put in to motion! The Career Footsteps campaign is run in partnership with the Edge Foundation and aims to highlight the different routes into employment to young people. 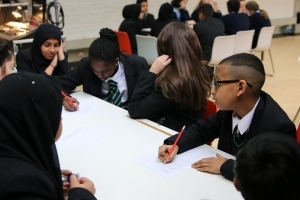 The Edge Foundation are an independent education charity; they commission and conduct research and campaign using the best evidence to influence education policy. Their ambition is for all young people to have equal opportunity to fulfil their potential whether that’s via apprenticeships, Further or Higher Education or employment and training. We hope this Careers Footsteps event will inspire your students and broaden their understanding of the options available to them. The Career Footsteps programme is open to all schools across the country and is completely free to use. Check out Career Footsteps on our website for more information. For direct enquiries email careerfootsteps@educationandemployers.org.